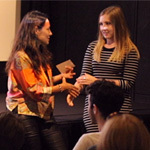 Students and Graduates from the course have won many awards. More surprisingly, one graduate, Morgan Morey is now using his modelling and sculpting skills as a modern jeweller and has won many awards for his work including a Gold Cartier Award in 2013. He has recently gone on to design the trophy for the 3D Printing Awards 2017. Alumni have worked on many films that have won Oscars and Bafta's, too many to mention here. Sniper Elite 1 – GOTY – TIGA awards, Sniper Elite V2 – Best action adventure – TIGA awards, Zombie Army Triliogy – best arcade game – TIGA awards, Sniper Elite 3 – best design – TIGA awards and several more. 2014, Rockstar Games received the BAFTA Academy Fellowship Award at the British Academy Video Games Awards. Of course its series Grand Theft Auto has been a constant, with the most recent GTA5 shipped over 80 million copies and is one of the best-selling and fastest selling video games of all time.